WELCOME TO THE BOAT-BOARD “FAQs” PAGE!!! This page is dedicated to explaining the superior Boat-Board.com STEP AND HANDLE product features that set it apart from the competition! · 10” x 10” step surface provides a big tread for either one foot, or both feet at the same time! 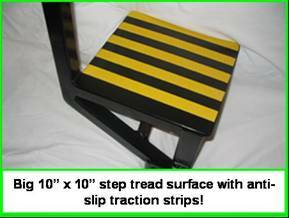 · Anti-slip traction strips on the step surface provides sure footed traction, especially when wet. · 1 ¼” square handle profile provides a comfortable hand hold that promotes confidence when boarding or exiting. · Handle height optimized for boarding assistance without limiting overhead clearance during outboard boat and trailer storage. 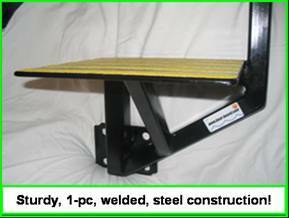 · Sturdy steel construction provides a strong, stable, and durable step and handle that can handle the weight of the even the heaviest man. · Fully welded 1-piece design allows for fast and easy installation to the trailer winch stand. 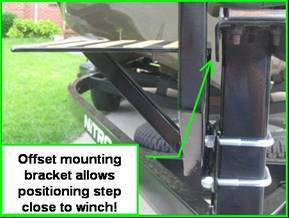 · Offset mounting bracket allows setting the step to an acceptable step height between the trailer tongue and the boat bow, close to the winch. · ½” diameter square corner u-bolt mounting hardware (normally used for trailer axles) provides rock steady attachment and easy step height adjustment. · Beautiful and tough powder coated paint finish keeps looking good for years. · Compact design doesn’t lengthen the storage space required for your boat and trailer equipped with a swing away or retractable tongue.